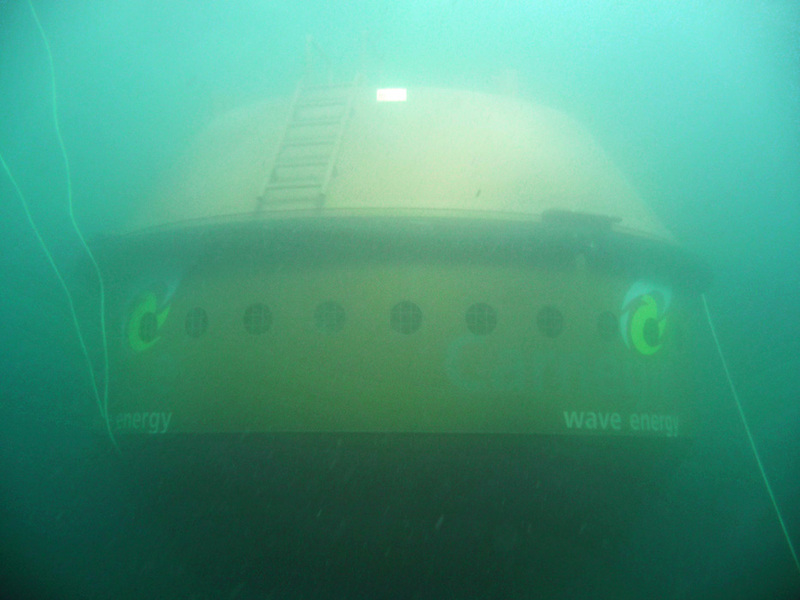 Carnegie offers a solution to the wave power generation industry with a zero-visibility, zero-emission solution called CETO. 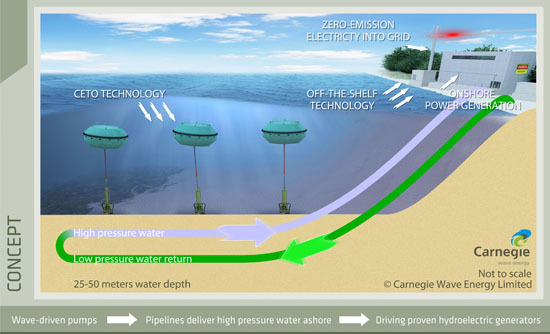 It is an interesting design in that it doesn’t create electricity right in the water, it pumps pressurized water to the electric generation plant which then converts the pressurized water to electricity, similar to that of a hydro dam. Development for this project has been underway since 1999, and in 2009 demonstrations for commercial units were started, giving Carnegie some history in the industry now. The benefits are clear with this system. The electricity is generated onshore, saving from loss, however, it begs to be asked is it more efficient to transfer pressurized water or electricity? This design is also scalable, meaning one could add more CETO units to increase the pressure. However, once again it begs to be asked, if the pressure is increased, how much can it be increased before the onshore electricity generation station is overloaded? I guess in a situation like this, the power plant would be equipped to handle so much Wattage, but run at much less wattage, with the option to increase the scale in the future should the power be needed. Because the CETO units are submerged, they are able to handle storms a little better than a unit that is floating on the surface, but it would still be subject to powerful waves. However, it appears that the CETO unit is under the surface of the water enough to avoid the high fluctuation of the surface waters during a storm.